Associate Professor Ali Hassan Zaidi feels right at home at Wilfrid Laurier University, where his teaching has brought the beauty of the world to his students through engaging courses featuring intercultural workshops and inspiring lectures. This past year, Zaidi, who teaches in the Department of Global Studies, coordinates the Muslim Studies Option and will be cross-appointed in the Department of Religion and Culture starting in September 2017, was honoured with the first-ever Laurier Award for Teaching Excellence in Internationalization. It also recognizes the need for balance — being aware of the international scene, with its ugliness, fear and violence, as well as the hope and joy in people’s lives, he says. 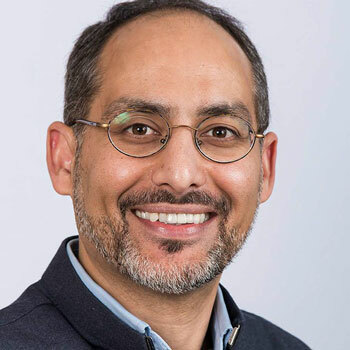 Zaidi has been teaching first- to fourth-year courses at Laurier since 2006, starting as a sessional instructor while working on his PhD, then moving to a limited term appointment and eventually a tenure-track position. "Excellent teachers come in many different forms, but what connects them all is an underlying sense of authenticity — one who engages with their students as a whole person and with passion for the material." Zaidi’s courses engage with the world in both its ugliness and now, more increasingly, its beauty. He has always considered his teaching to be effective, but it was not until around the time of his sabbatical in 2012 that Zaidi recognized the need for change. Now, his focus on a deeper level of engagement is something he consciously pursues and he believes it resonates with students. Upon reflection, Zaidi saw that students would often leave class feeling overwhelmed and at the end of four years of talking about global problems, without seeing big solutions, they left university with crushed idealism. It was an unintended outcome, he explains. He spent his sabbatical teaching in Lahore, Pakistan, and he also had an opportunity to travel with his family throughout Morocco, Spain and Qatar. Zaidi saw people — living on the frontlines of extremism, poverty and violence — remain hopeful and optimistic. He returned to Laurier wanting to convey that positivity. With this realization and adjustments, Zaidi saw his students respond in ways he did not expect. He began reaching out to key partners at Laurier, including Nadine LeGros in the Centre for Teaching Innovation and Excellence (CTIE), who helped him develop intercultural workshops in his courses and evaluated students’ openness to cultural change by using personality indexes. Zaidi also incorporated music and calligraphy workshops and began working with community partners, such as the Ismaili Council of Ontario and the Pakistani community in Waterloo Region, to bring speakers from the global South to Laurier’s Waterloo campus. He adds that students want to be inspired, remain hopeful and know that they can make some change in the world.